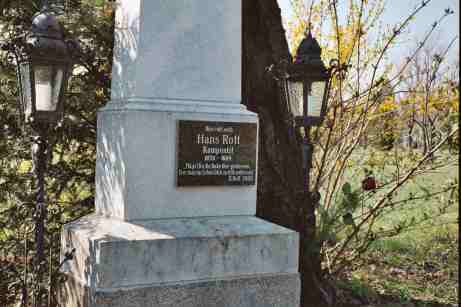 On March 31, 2004, the Internationale Hans Rott Gesellschaft put up a commemorative plaque at the hitherto anonymous burial place of Viennese composer Hans Rott at Vienna Central Cemetery. Hereby, a first monument was erected to Hans Rott - Anton Bruckner's favourite student and Gustav Mahler's fellow student - in his beloved home town. 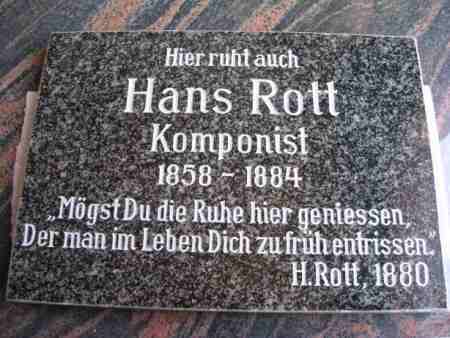 "May you enjoy the peace here Which had been snatched from you too soon in life" is the epitaph Hans Rott, who died at the age of not yet 26, had laid down in his will. Now, 120 years later, his wish was fulfilled at long last. The ceremony took place in the presence of many members of the Internationale Hans Rott Gesellschaft and interested people from Austria and Germany, among them relatives (the granddaughter, the great-grandson and the great-great-granddaughter of Hans Rott's half-brother Theodor) which had been found thanks to the research work of our founding member Marcella Stern. 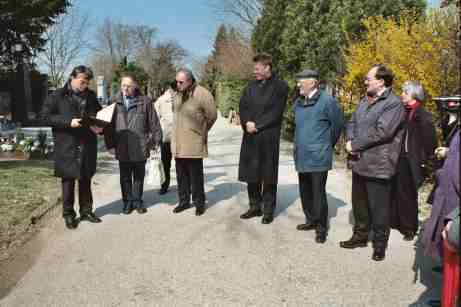 There were also present the grave owners who very kindly had given their consent to putting up the plaque at their grave, as well as Dr Rainer Bischof, President of the Internationale Gustav Mahler Gesellschaft. 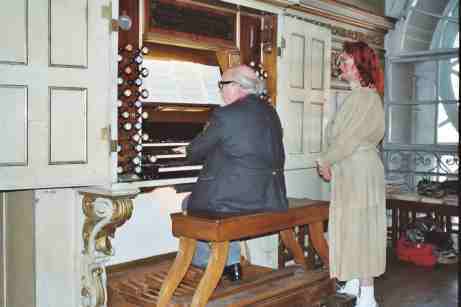 In the afternoon, an organ concert took place at Piaristen Church where Hans Rott had been organist. Erwin Horn, Vice President of the Internationale Hans Rott Gesellschaft, played the very organ, which once had been played by Hans Rott and Anton Bruckner - as usual assisted by his wife Roswitha who did the registration. He presented among other pieces his transcription of the first two movements of Hans Rott's Symphony No. 1 in E major. The concert became the final highlight of that memorable day. 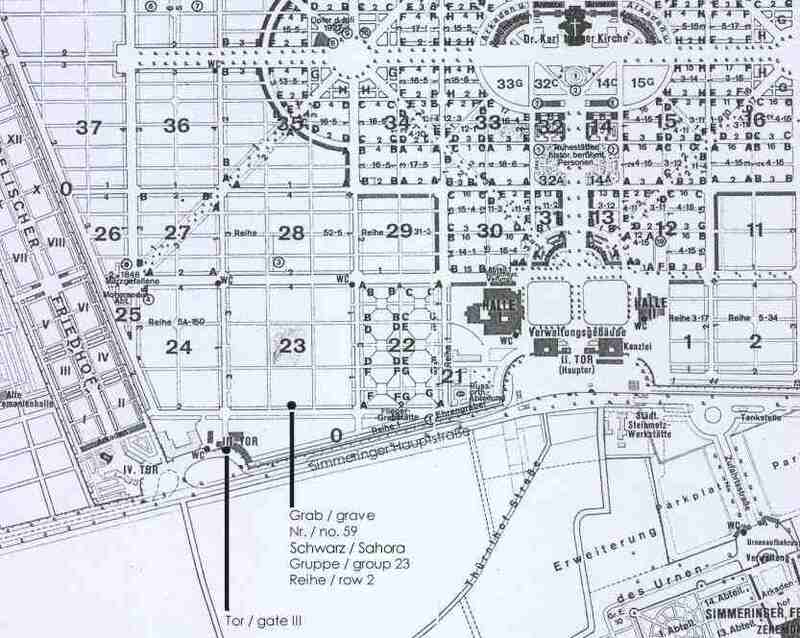 Those who want to visit Hans Rott's grave (Wiener Zentralfriedhof/Vienna Central Cemetery, Simmeringer Hauptstrasse 234, group 23, row 2, grave no. 59) will find a map at www.hans-rott.de/plan.jpg. On January 2, 2004, the Symphony for String Orchestra in A-flat major had its world premiere in Baden/Switzerland. The Cappella dei Giovani played under their conductor David Schwarb. A good month later, on February 4, 2004, Muenster/Germany witnessed the world premiere of the Prelude to "Julius Caesar". The Junge Sinfonieorchester played with Werner Marihart conducting. On March 11, 2004, the first German performance of the Symphony for String Orchestra in A-flat major took place in Mainz: The Philharmonisches Orchester des Staatstheaters Mainz played with Enrico Delamboye conducting. This means that the better part of all performable works by Hans Rott have been performed by now. July and August will see performances of the Pastoral Prelude and some Lieder, so for instance during the Gustav Mahler Music Weeks at Toblach/Dobbiaco. From September until the end of this year, the Symphony No. 1 in E major will be performed eleven times in various Saxon towns as well as in Cologne and in Tokyo (Asian premiere). In November, there will be the Austrian premiere of the Pater Noster. On April 12, 2005, there will take place an important world premiere in Hagen/Germany: The Philharmonisches Orchester Hagen with Antony Hermus conducting will perform the Suite in E major. Combining it with Gustav Mahler's Symphony No. 1 is an interesting aspect. At www.hans-rott.de/whatson.htm you will find more detailed information. The Mainz concerts in March 2004 have been recorded. 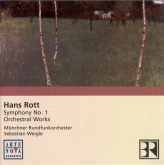 It is likely that there will be a CD with Hans Rott's works performed there (the Symphony No. 1 in E major, the Symphony for String Orchestra and the String Quartet in c minor) which would be highly welcome for the interpretations are very good and interesting. The Arte Nova CD with orchestral works by Hans Rott which had been announced already in the last newsletter will come out on June 21, 2004. The Münchner Rundfunkorchester with Sebastian Weigle conducting has recorded not only the Symphony No. 1 in E major but also the Orchestral Prelude in E major and the Prelude to "Julius Caesar". The price (5 - 7 Euro) is very moderate. For further details and audio samples see www.hans-rott.de/cdeweigl.htm. Last but not least we would like to inform the members of the Internationale Hans Rott Gesellschaft already today that the next General Assembly will take place on Saturday, October 16, 2004 in Cologne/Germany. Our members will receive a separate invitation in due time. We have chosen this date to give all members interested the opportunity to attend a performance of the Symphony No. 1 in E major by the WDR Sinfonieorchester Köln with Neeme Järvi conducting after the General Assembly and/or the previous evening. The ticket sale will begin before long. We would like to invite all addressees of this newsletter to become members of the Internationale Hans Rott Gesellschaft and support our work also by their member fees. The more members we have the larger the scope of our activities will become. Details on our Society and about the membership you will find at www.hans-rott.org. Those of you who are already members we would like to invite to try their hands in recruiting new members. As usual, the members of the Internationale Hans Rott Gesellschaft will receive more detailed further information by the next circular letter.